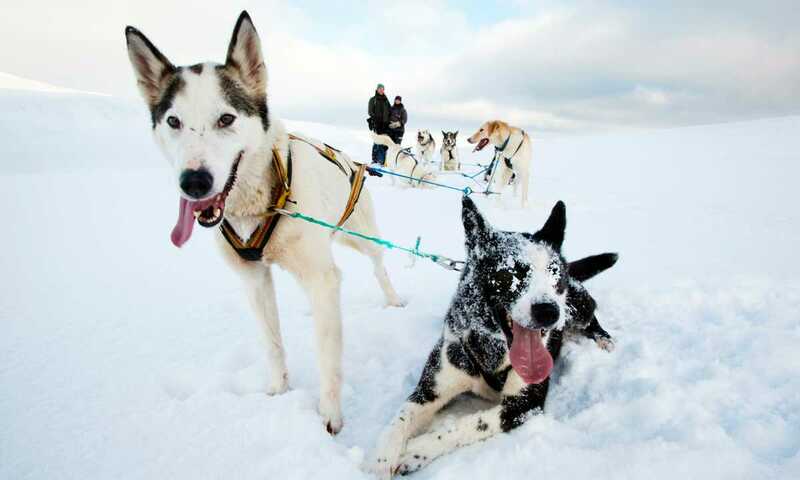 If you’ve ever dreamt of mushing your own team of husky dogs across a pristine snowy wilderness, this is the trip for you. Travelling over 3 days as part of a small group and camping overnight in specially designed tents - this is a proper boy’s own Arctic adventure. With less equipment, and a different goal than Amundsen, you leave Longyearbyen, and head east. Travelling with a team of dogs is a fantastic way to travel. The silence, with only the panting of the dogs gives you the chance to really enjoy the landscape. Your guide will show you how to harness the dogs and how to mush your own team. Everyone will look after your own dog team throughout the trip, and help with the feeding. You travel over vast valleys and through the white landscape to Sassen valley and Tempelfjorden. Towards midday, stop for expedition lunch and let the dogs rest for a while. You arrive to the new expedition campsite, North Pole Basecamp during the evening. Here you have warm tents with comfortable beds and warm sleeping bags waiting for you. In the morning, you feed the dogs before enjoying your own breakfast with fresh bread and warm coffee. You harness the dogs and head out in the beautiful landscape. Today you mush on the frozen sea ice, where you can see seals laying on the ice enjoying the warm sun, and if you are lucky you might even see a polar bear hunting. The majestic Tuna Glacier is one of the highlights of the day. Expedition lunch will be served on the way. You will return to the camp later in the afternoon for some well-deserved drinks. After the dinner, you can have an evening walk to stretch your legs and greet your dog team before heading to the heated tent and warm sleeping bag. This is the last day of dog sledding so get up early to make the most of the day. You feed the dogs and yourself before harnessing the dog teams one more time before heading back towards Longyearbyen. Enjoy the view while travelling through the vast valleys. Half way you stop for expedition lunch. Although you have not reached the North Pole on your trip, you have travelled in the spirit of the famous explorers; Amundsen, Nansen, Wisting and Nobile. You will arrive to Trappers Station later in the afternoon and take care of the tired dogs. Say farewell to your friends, who have been pulling your sled for more than 120 km during the past three days. Prices quoted below are per person based on a group of 4 people. This trip can run as a group trip, with prices starting from $2,217 per person for a complete group. If you are looking to join a group or you are a solo traveller we will help to form likeminded groups of travellers. Please let us know your travel plans. In Spitsbergen, weather conditions can change quickly and the trp may be faced with heavy winds, snowstorms, thick fog, crevasses and lack of snow or ice. This means changes to the planned route may be necessary, and could lead to you not arriving to the planned destination. It could also mean that a different transportation style or accommodation may be necessary. All activities and accommodations outside Longyearbyen needs to be approved by the local authority on yearly basis. We will get the final approval on all expeditions and camps for the coming year during the autumn time. This program is based on the assumption that the local authority approves setup and location of the excursion.